Your system is running on Linux with multiple physical network interface cards (NIC) and each card has its own default gateway. By default, you can only set up a single default gateway on a system. 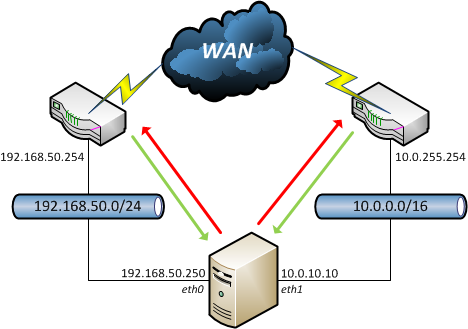 In our example, we will consider 2 NICs (eth0 and eth1) enabled with default gateway configured on eth0 interface. 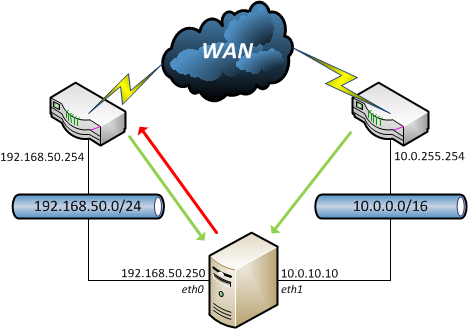 In the first case, there is no problem, each NIC will work independently but in the second case, if you configured default gateway on eth0, whatever the network card receiving the request, it will answer through eth0 which is the default gateway. And now, restart your networking service to set this new configuration up. This will be permanent. You can now connect to your server using both interfaces, and it will automatically answer correctly through the good gateway !